As the game’s level designs get larger and more complex, so to do the patrol routes of its characters. For example, Rico Delgado and Andrea Martinez – two of the three targets on the new Columbia map – are capable of wandering across large swathes of the level. Ensuring that they are in the right place at the right time could have become tiresome had IO not intervened. “Because there are three targets in Colombia it gives us a bit more freedom to give them their own domain, but they can be moved in and around their usual areas – Andrea, especially, can go to quite long extents of the map,” IO senior community manager Travis Barbour tells us. “But that means that we have done some things the backend so that if we can see that you’re doing a certain opportunity, we won’t keep you waiting too long depending on the target loop. “It gets a bit technical, and breaks the immersion a little bit [to reveal this], but we look at what you’re trying to do. We know that in three steps time, if you go for a particular opportunity – or mission stories as we call them now – that the target is going to be really far away, and we kind of interrupt their loop with whatever they’re doing over here, and start to bring them back to where they might have to end up being as part of that opportunity. 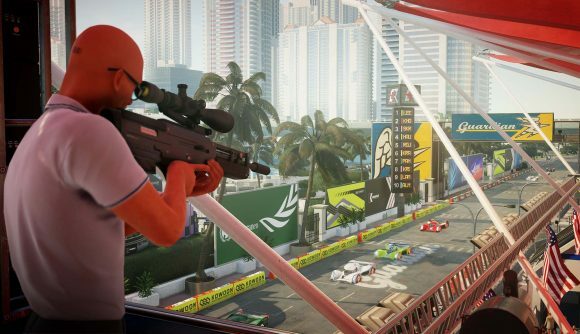 There will still be plenty of times when waiting is important, of course – one method of killing Sierra Knox in the Miami level, for example, requires you to wait for her car to cross a certain point during a race – but IO is striving to strike the perfect balance between tension and waiting around.